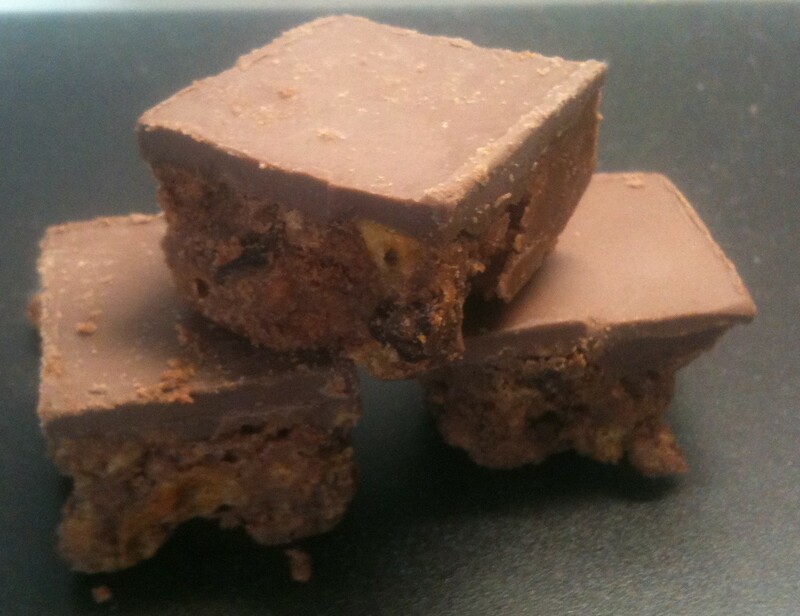 These Gluten Free Tiffin Biscuit Bites are my newest addiction, probably because they are an ingenious and delicious combination of four things that I completely love – Chocolate Biscuits, Honeycomb, Raisins and Milk Chocolate. 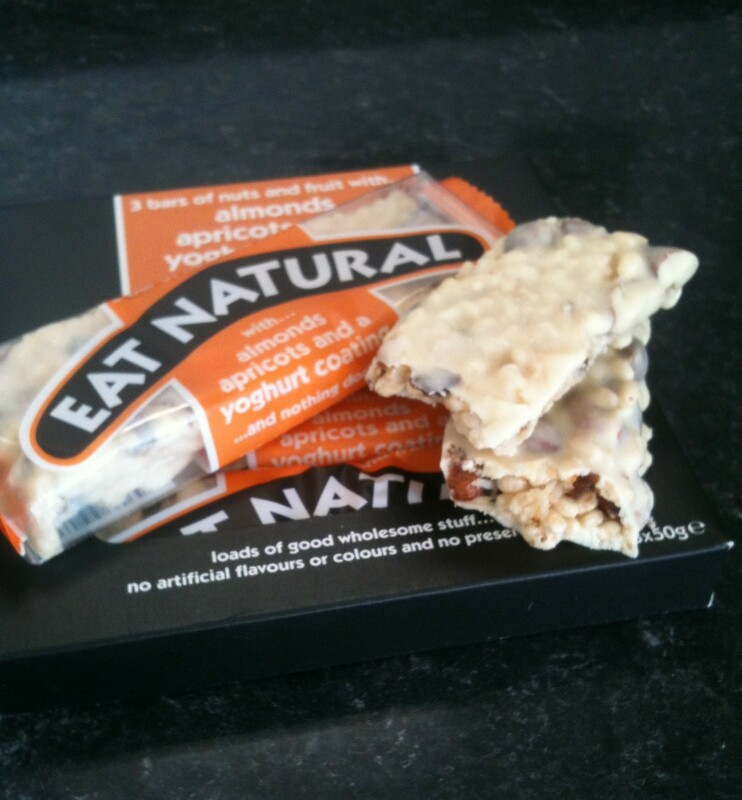 This mixture of textures and flavours works incredibly well, the Biscuit is crunchy but not as crumbly as Gluten Free biscuits often are and the Honeycomb has a great spicy, gingery taste and is soft rather than being teeth rattlingly hard. There is a generous amount of Raisins and a reasonably thick Milk Chocolate topping. 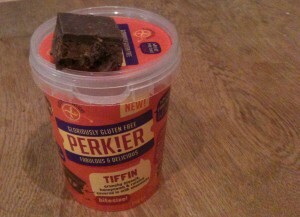 They are made by Perkier, a UK based company specialising in Gluten Free foods, as well as these Biscuits and other treats they also make porridge and bread and say on their website that they are keen to challenge the current model of Gluten Free food costing a fortune. 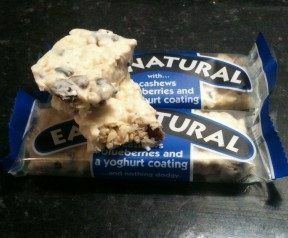 I haven’t tried the whole range but they are definitely off to a good start with these, I picked up a tub from a local Tesco for under a couple of pounds and was impressed by the amount of bite sized biscuits in the tub – I didn’t count but there was at least 10, maybe more. The advantage of the “bite” sized serving is that you can hopefully exercise some degree of portion control when eating these, if you don’t feel able or want to restrict yourself in this way than you can buy this in a 65g sized bar as well. To be honest most of the time I probably end up eating the same amount as I would if I bought a bar and if I ate less it’s probably because it was in a decent sized bowl of ice cream (if you have even the slightest interest in Ice Cream I HIGHLY recommend trying this..). Not to worry though, despite being quite indulgent these arent as unhealthy as you might imagine, each piece containing around 58 calories, 2 grams of saturated fat and 7 grams of sugar. Perkier also make Gluten Free Rocky Road biscuits which are again available in a tub with small bite sized pieces or in a 65g bar. 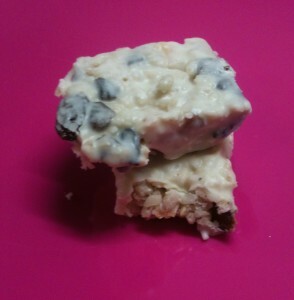 These use the same Chocolate Biscuit base as the Tiffin but add small pink and white Marshmallows to this and cover it in Milk Chocolate and then drizzle White Chocolate over this. 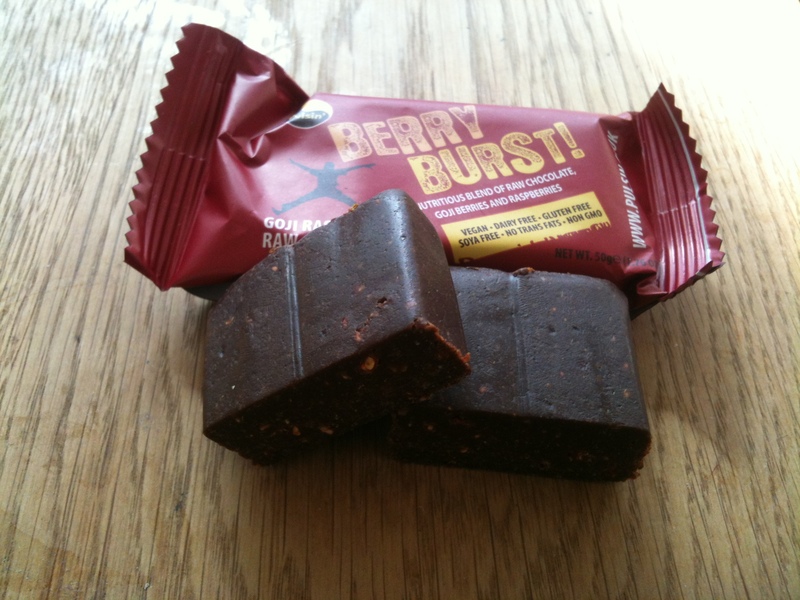 I didn’t like these quite as much as the Tiffin, probably because I’m not a massive fan or Marshmallows and as I said I absolutely love both Honeycomb and Raisin. Don’t get it twisted though, I had no problem working my way through the Rocky Road tub in well under a week. 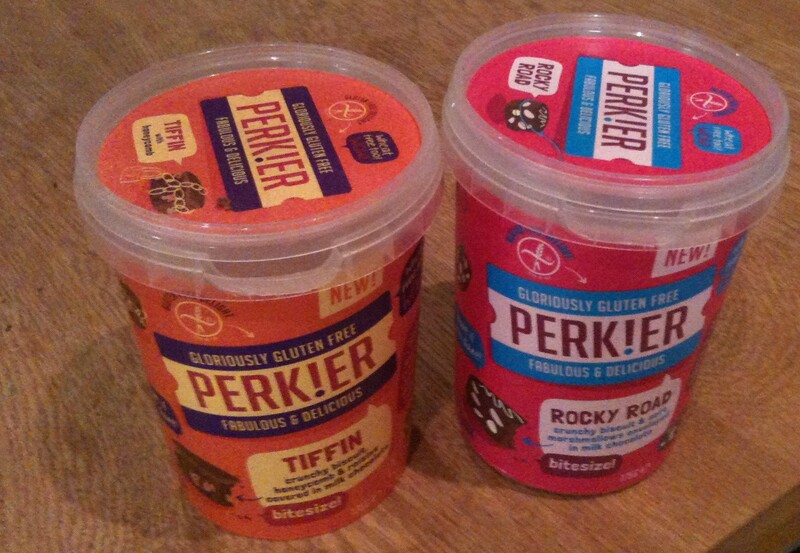 As you can probably tell, I really can’t recommend these highly enough and am planning to test my way through the rest of Perkier’s range of Gluten Free instant Golden Syrup and Berry Porridge Pots and Breads as I find them – they seem to be increasingly available in more and more major UK supermarkets – and only hope that these products manage to maintain the same great combination of reasonable price and great flavour found here. 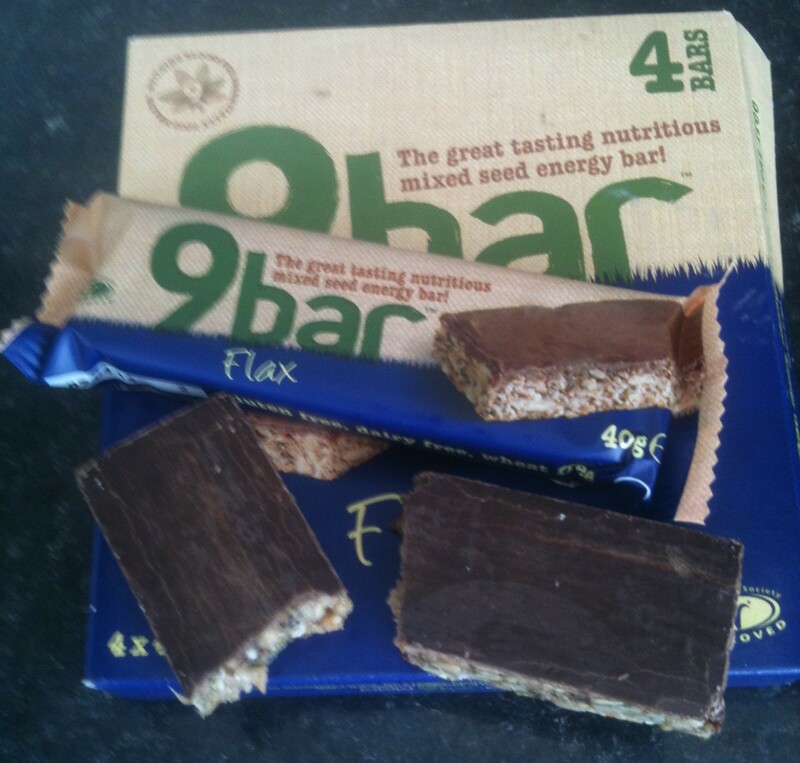 Article posted in Products, Snacks on February 26, 2014 by Ray Smith. Everyone seems to have one thing they really miss when they start eating Gluten Free. 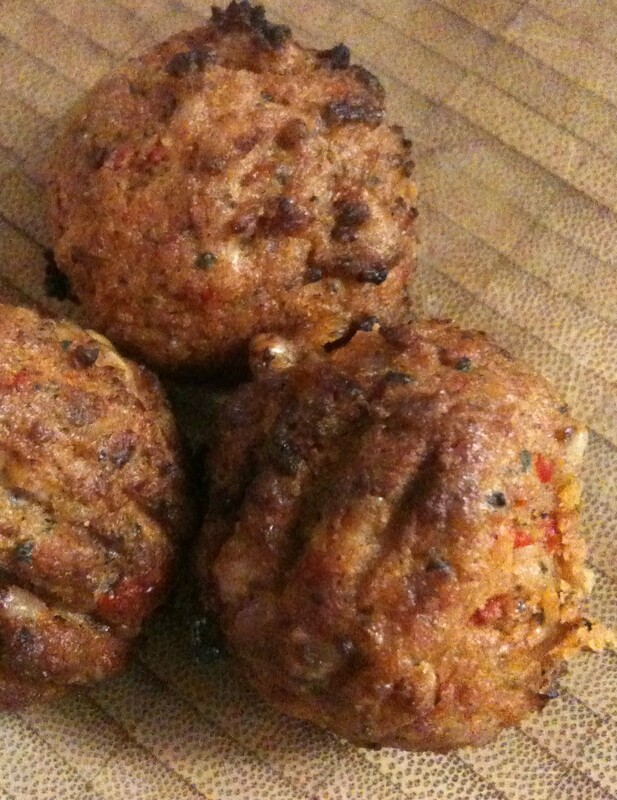 For me it was Falafel, there are quite a few recipes for Gluten Free Falafel around but as it’s something I used to eat for lunch or as a quick snack making it from scratch wasn’t really an ideal solution for me. 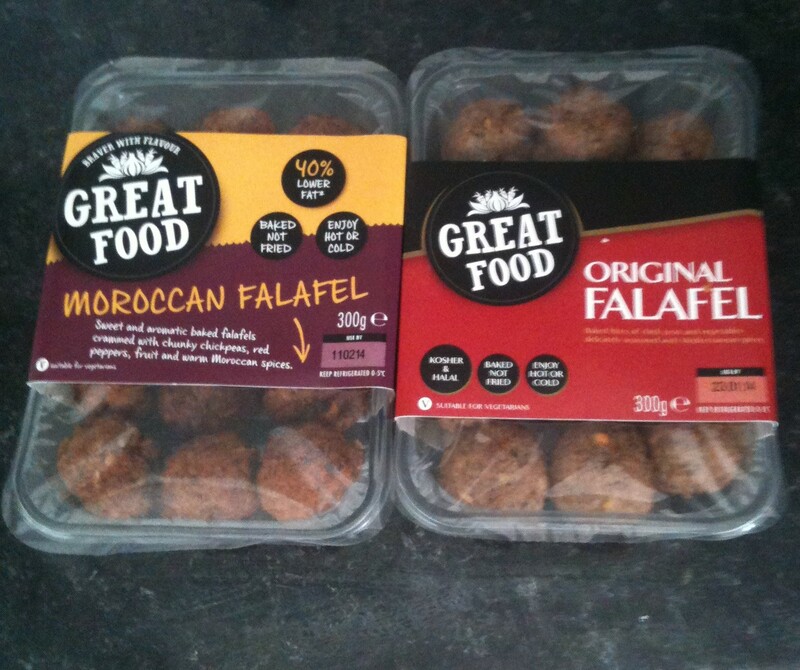 But then while wandering around the supermarket in my usual daze I discovered these Gluten Free Falafels made by Great Food. 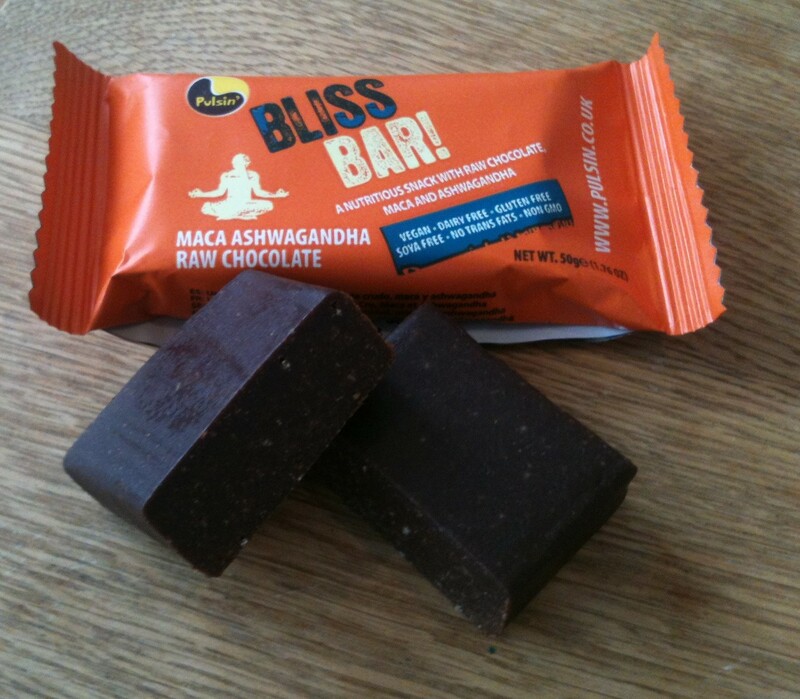 They are available in lots of high street supermarkets in the UK and as well as being Gluten Free they are also Kosher and Halal and suitable for Vegetarians. 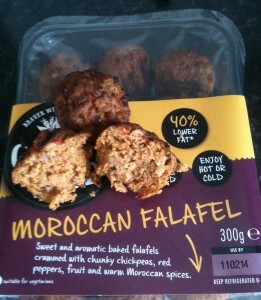 They are really good value, with a 300g pack of 14 decent sized Falafels costing less than 2.50. I find that with a salad and a dollop of Houmous two or three are enough for a filling lunch so you can get plenty of meals from one pack. 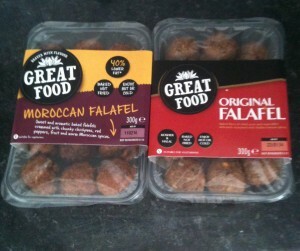 These keep well so you don’t have to worry that you will be eating nothing but Falafel as soon as you open a pack – although that might not be a bad thing… They are steam baked in special ovens not deep fried which means they are quite a healthy option, Each Falafel (depending on the flavour) has between 2 and 4 grams of fat and is around 60 Calories. They’re low in Sugar and don’t contain an excessive amount of Salt. There is a wide variety of Falafel available now made from all kinds of ingredients but these stick to the original Recipe and the main ingredient is ground chickpeas. They come in two flavours Original and my favourite Moroccan, the most noticeable difference between the two being that the Moroccan flavour is a little spicier and contains fruit – Dates and Apricots. I find these are one of those products that are really convenient to have in the fridge at all times for when you want to throw together a quick lunch to eat at home or put them in your lunchbox in the morning. They taste great cold but if you want to heat them up just put them under the grill for 5 minutes or so. 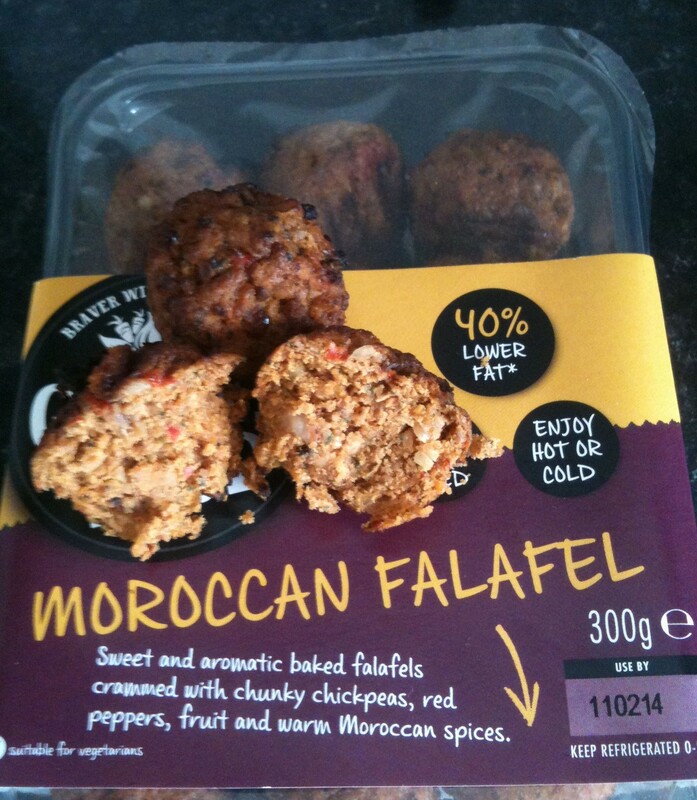 Obviously they go really well with Houmous but they are also a great way to liven up a salad and of course, if you have some Gluten Free Pitta or other bread you can add them to a wrap or sandwich. 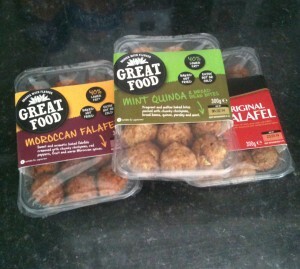 So if like me you’re missing Falafel or if you’re just looking for some new ideas for Quick, Easy and Healthy Gluten Free Lunches these come highly recommended. 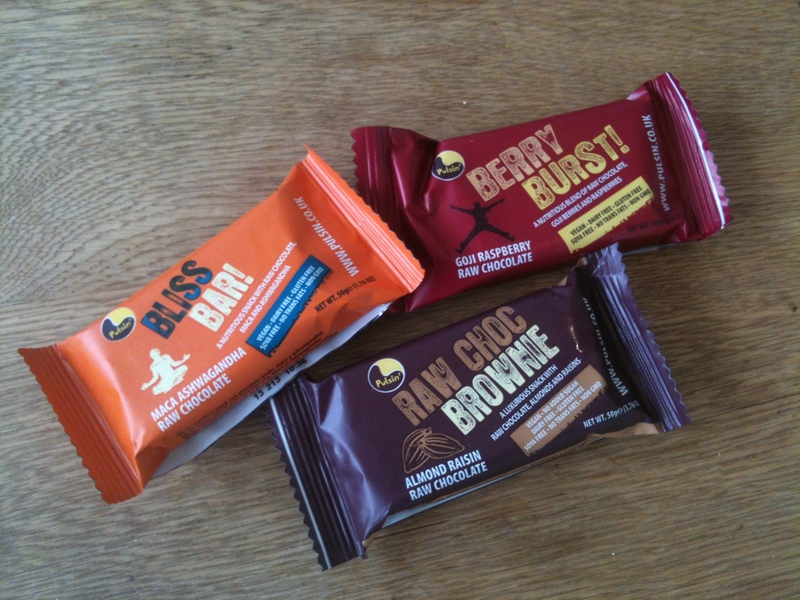 It’s also worth checking out the rest of the Great Food range. They are a UK company with a great range of healthy and mostly Gluten Free snacks, bites, burgers and houmous. I’m planning to work my way through their entire range as I’ve like everything I’ve tried from them so far, as well as Falafel I’ve tried their Sweet Potato Pakora which I like almost as much as these and their Quinoa, Mint and Broad Bean bites which are another good option for lunch. Article posted in Products, Snacks on January 26, 2014 by Ray Smith. There is quite a wide range of Gluten Free Cereal and Muesli available from UK supermarkets and many of these are pretty healthy and full of nutritious ingredients. 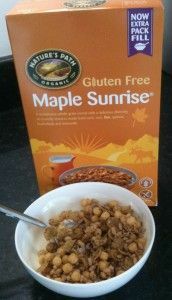 However, if you’re looking for a slightly less worthy breakfast, maybe as a reward for sticking to your diet all week or as a Gluten Free replacement for the less healthy cereals everyone else gets to enjoy from time to time, this Nature’s Path Maple Sunrise is a good option. Nature’s Path is a Canadian company and independent and family owned. They specialise in gluten and wheat-free cereal products and sell a wide range of these in North America. 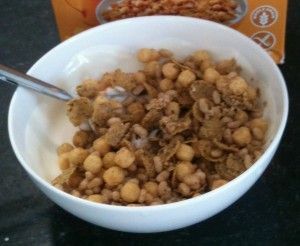 Their breakfast cereals are now widely distributed in the UK and you should be able to pick these up in any UK supermarket big enough to have a “Free-From” section. 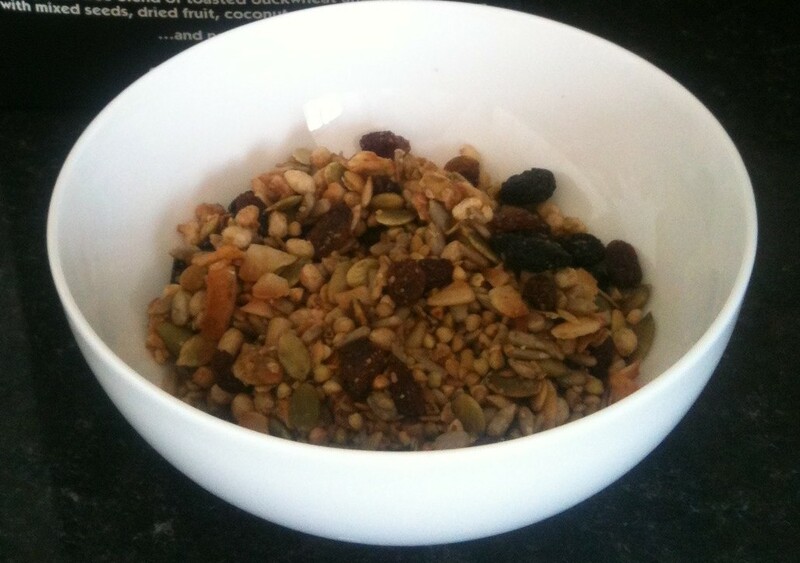 This is an extremely crunchy Cereal and won’t go soggy after you’ve added milk. If that’s how you choose to eat it, I prefer it with a couple of spoon fulls of Greek yoghurt and sometimes add blueberries or another berry to aid me in my daily quest to eat my government recommended 5 portions of fruit or vegetables. Its quite sweet and the maple flavour is quite strong, as soon as you open the packet you’ll get a strong scent of Maple syrup. 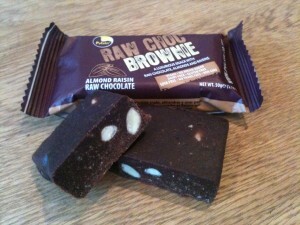 If you don’t have much of a sweet tooth you probably won’t need to add any extra sugar to this. 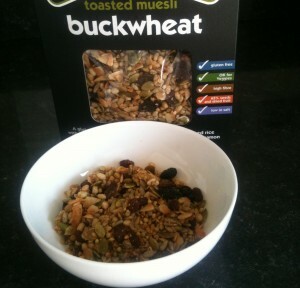 However, the taste might lead you to think it has a higher Sugar content than it actually does – a 30g serving contains just under 13g – a little higher than some other Mueslis available but not distressingly so and still lower in sugar, calories and fat than most of the super sweet breakfast cereals we’ve all heard of. On the downside its also quite low in fibre, just 3g per serving, and Protein. 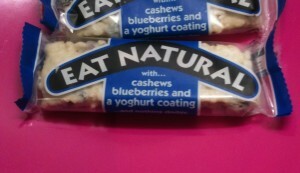 Despite being very sweet, this is still quite a healthy option. It’s certified Organic and contains six different grains, quasi-grains or seeds – corn, brown rice, quinoa, buckwheat, flax, and amaranth. The fact these are whole grains and not refined or processed and that there is a wide diversity of them is good news for your health. This diversity of ingredients also gives the cereal a good texture. some of the grains are left whole so it has a variety of three different shapes – little round puffy balls, flakes and small crispy seed shapes. I’d recommend this if you eat cereal regularly and are interested in trying a different one every so often for a bit of a change. You can find it in most big supermarkets for around Three pounds a box but can save some money by buying it in bulk from Amazon. Article posted in Cereal, Products on December 8, 2013 by Ray Smith.